The sequence begins immediately after Ricci has lost his last best hope of finding his stolen bicycle. He has found and confronted the thief, but it is too late. The thief has already disposed of the bicycle and Ricci cannot prove that he has taken it. Not only can we infer that Ricci has lost all hope of being able to keep his job and hence his faith and hope for a better future, we can also intuit his pain at being mocked and humiliated in front of his young son, who, he must fear, has lost faith in his father's ability to get justice from the world. 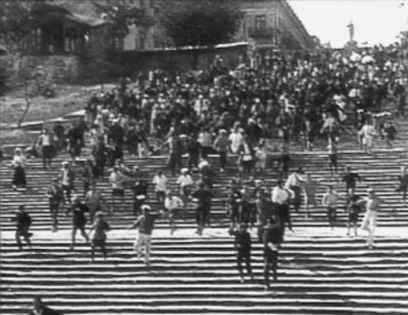 It is truly a bitter moment in the film, which De Sica forces us to contemplate at length as he cuts to several long takes of Ricci and Bruno walking through the city streets in defeat. of the frame, parked by a doorway, still unattended. Ricci again turns away, as if changing his mind, but he cannot resist just one more look back. The camera then tracks with him as he turns back and joins Bruno. The relatively long take in shot 15 brilliantly illustrates the point André Bazin makes in his influential essay "The Virtues and Limitations of Montage." Here Bazin argues (and I have already touched on this in chapter 3) that certain filmic situations are aesthetically more powerful if captured in one long take as opposed to being fragmented into a number of short shots through editing. Editing creates abstract or approximate spatial relationships between objects. When, for example, a person is shown looking intently at something in one shot and then we are shown the object of his or her gaze in the next, we get the impression that the space in the second shot is nearby, but we never know for sure how much space actually separates the two images. In the sequence under analysis, for example, there are several point-of-view shots of the stadium seemingly taken from where Ricci is standing. 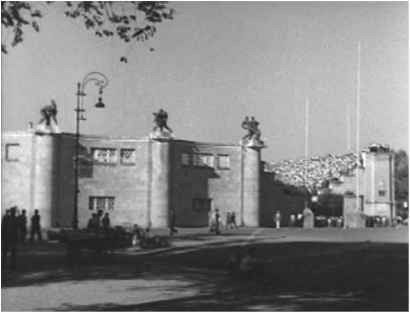 But because we never see the stadium and Ricci in the same frame, or within the confines of one shot, we have no idea of the true spatial relations between them or, indeed, if a stadium really exists in the vicinity. Its existence could be purely an illusion created by offscreen sound effects and editing. While Bazin does not argue that one should never create fake spatial relationships through the use of editing, he does believe that certain dramatic situations demand the long take in order to preserve for the viewer the real time and space in which the action occurs. Up until shot 15, De Sica has fragmented the space of the action, breaking it up into little pieces—point-of-view shots, reaction shots, shots held together through movement matches, and so forth, with each shot lasting from three to four seconds. 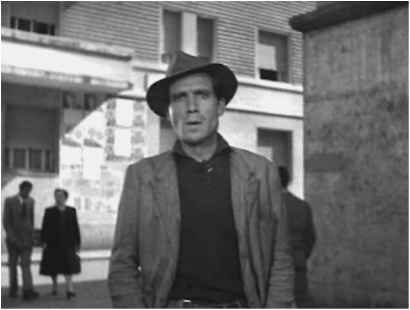 But in shot 15, which is held for eighteen seconds, De Sica preserves the temporal and spatial unity of Ricci's actions by following him with the camera. We witness his movement first toward the bicycle (his temptation), then toward Bruno (his conscience) in real time and space, as we would if we were seeing the action in the real world, or in the theater. 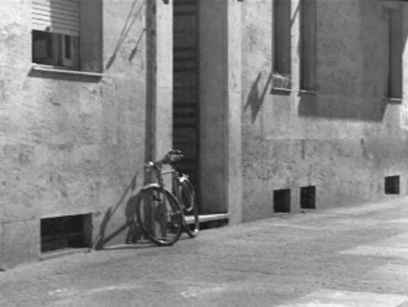 By capturing Ricci, the bicycle, and Bruno within the confines of the same shot, De Sica gives us a more vivid experience of Ricci's internal conflict. Bazin, as discussed in chapter 5, preferred long takes with deep-focus images because they allow the viewer's eyes to wander around the image and construct meaning for themselves. Nothing is forced on the viewer's attention. Earlier in the sequence, when we first saw the unattended bicycle from Ricci's point of view, our eyes were directed to it through the use of a close shot. In shot 15, however, the bicycle is tiny in the background of the frame. As in the example from Citizen Kane, when young Charles Kane appears tiny in the image while his mother signs papers that will change his life, the most important image is the tiniest object in the frame. In both cases the use of the long take and deep-focus shot creates an effect that is roughly equivalent to understatement in literature. At the end of shot 15, Ricci sits down on the curb next to Bruno and looks up. Shot 16 is his view of the soccer stadium. The game is still in progress. This shot imbues the action with a certain amount of time pressure—another deadline. Probably Ricci would have more success in stealing the bicycle before the game lets out and too many people are around. Shot 17 is a reaction shot, taking us back to the same set-up as at the end of shot 15, of Ricci sitting on the curb next to Bruno. Ricci puts his hands to his face very much as Bruno had done earlier, but this shot speaks Ricci's temptation and conflict. Should he act? Should he try to steal that bicycle? Bruno is watching him intently and warily, almost as if he can read his mind. Shot 18 is an abrupt cut to a blurry close shot of bicyclists whizzing by from screen right to screen left. The camera pans left with their movement until it reveals Bruno and Ricci still sitting on the curb. At this point, the camera slowly moves closer to Ricci and Bruno, zeroing in on their reaction. The contrast between the static, forlorn pair and the dynamic motion of the bicyclists increases our sense of all Ricci and Bruno have lost. They follow the movement of the bikers with their eyes until Ricci can stand it no longer. He rises from the curb. His action is completed in shot 19 (through a smooth movement match). He looks off in the direction of the stadium. Shot 20 is a high-angle shot of the stadium. People are pouring out of it now. In shot 21, the camera follows Ricci as he goes back to the place where he first observed the unattended bicycle. It is still parked by the door. He turns back in the direction of Bruno. Ricci's desire to have one himself almost unbearable. His action of taking off his hat and pulling his hair speaks volumes about the pain of his conflict. 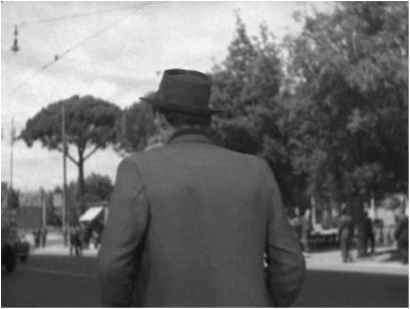 Shot 27, in which Ricci looks offscreen in the direction of the unattended bicycle and puts his hat back on, signals that he has made a decision. In shot 28, Bruno looks at his father almost accusingly, again as if he intuits what Ricci is thinking. In shot 29, another long take lasting twenty-two seconds, Ricci pulls Bruno up from the curb, hands him money and speaks the first line of dialogue in over thirty shots: "Here. Take the streetcar—wait at Monte Sacro." Thinking he has rid himself of his inhibiting son, Ricci turns around and heads toward the object that tempts him. But Bruno, like a sticky conscience, disobeys his father, following closely in his footsteps. Ricci, exasperated, yells, "You heard me. Go on." This time Bruno, looking troubled and bewildered, exits from the frame as his father glares after him. The camera follows Ricci's movements as he turns the corner and heads in the direction of the unattended bicycle. At this point comes what is for me the most powerful moment in the film. Shot 30 is a cross-cut to Bruno running for the streetcar, but he just misses it. Now the audience knows something that Ricci does not. He has not gotten rid of Bruno after all. This shot is so powerful because it adds a new layer of suspense to an already almost unbearably suspenseful situation. The first layer of suspense involves the questions: Will Ricci give in to the temptation to steal a bicycle and, if he does, will he get caught? Bruno's missing the streetcar complicates that suspense by adding another dimension to the suspense, a moral and psychological dimension. Now we are made to wonder what will happen if Bruno witnesses his father's thievery. How will he react? I cannot speak for every spectator of this film, but in trying to figure out why this moment in the film has such power for me, I arrive at this formulation: I have come to share Ricci's alienation and desperation and hence I want him to succeed in stealing the bicycle. I want his life to get better no matter what the moral cost. This is not so unusual. Many movies encourage transgressive identifications, and thus seduce us into rooting for someone to get away with a crime. But Bruno's presence at the scene of Ricci's temptation is a complicating factor. Knowing that Bruno may witness his father's thievery puts me in conflict. Because I am so identified with Ricci at this point, Bruno functions as my conscience as well as his. But—and here is the real sticking point—as much as I cringe at the possibility that Bruno may see his father succeed at becoming a thief, at the same time, more than ever, I do not want him to get caught and hence fail once again in front of his son. Because of the above context, shot 31, a cross-cut back to Ricci now lurking in closer proximity to the bicycle, creates mixed feelings of excitement, suspense, and dread that remind me of the best moments in Alfred Hitchcock's films. Ricci casually walks past the door adjacent to where the bicycle is parked, and looks in to see if anyone is watching. Then he turns around, mounts the bicycle and begins to ride away. A split second later a man comes out of the door crying at the top of his lungs, "Thief. Help. He's got my bicycle. Thief. Stop him." In shot 32 a group of men nearby hear the man's cry and come running. Shot 33 is a long shot of Ricci trying to escape on the bicycle, a group of men in close pursuit. Ricci emerges from screen right in shot 34, having gained no distance from his pursuers. We know he is doomed. Shot 35 is a cross-cut to a medium close-up of Bruno. His anxious stare suggests he is witnessing his father's futile attempt to escape. Shots 37 and 38 are particularly emotionally intense because they are from Bruno's point of view: The spectator is placed, as it were, in the shoes of the son as he sees a group of angry men close in on his father and bring him down. Shot 39 is a medium close-up of Bruno's stunned reaction. The camera holds on his stricken face until he runs out of the frame in the direction of his father. This moving solidarity between father and son is not, as some critics claim, a concession to the feelings of the audience, but an integral part of an important theme that plays throughout the film and is part of the film's political message. Ricci realizes earlier in the film, when he fears that Bruno may have drowned, that the loss of the bicycle is insignificant in relation to the possible loss of his son. 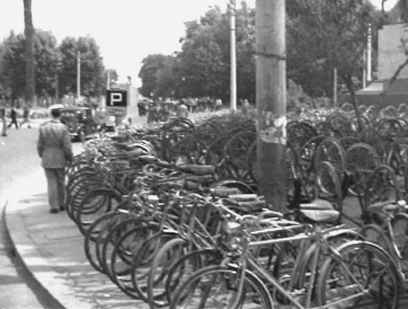 Yet the film makes clear that the loss of the bicycle has threatened Ricci with the loss of Bruno throughout the film. So preoccupied is Ricci with finding his Fides that he dangerously ignores his son's needs and even his safety. When Ricci himself becomes a bicycle thief, he is threatened not with the physical loss of his son but with the loss of his son's admiration and respect. 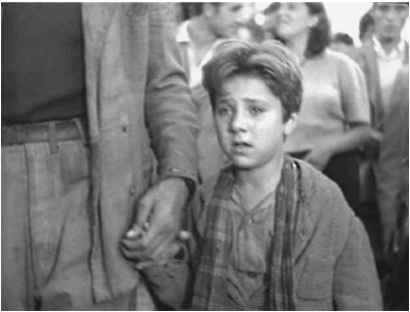 While De Sica persuades us that people matter more than things, and that Bruno's love for Ricci, despite everything that has happened, is a kind of saving grace, he simultaneously makes it clear that neither people nor love are safe in a world of economic scarcity. At the core of De Sica's and his scriptwriter Caesare Zavattini's brand of neorealism was a strongly humanist and reformist impulse. They hoped that by honest portrayals of ordinary life in which human bonds are threatened by a disordered and unjust society, they could create a bond between the audience and the characters in the film so that those who saw their films would be sharply aware of how society needed to change if human life is to pros-per.11 The final shot of the film, a static shot of Ricci and Bruno disappearing into the crowd, becomes a bitter cry of protest. It leaves us with the feeling that theirs is only one sad story among countless tales of suffering in the dysfunctional social order of postwar Italy. Why does bicycle thief end so abruptly?